The Dal Tigers women's basketball team always knew when their coach, Carolyn Savoy (1947-2015), was very, very serious about a game: she’d show up on the court in a suit. It’s safe to say “Coach Savoy” (as her players called her) meant business much of the time. 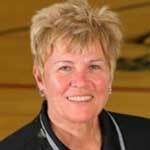 She holds the record for most games won of any women’s basketball coach in Canadian Interuniversity Sport (CIS) history: 858 wins in 39 years, with an astonishing 75 per cent win record. Dr. Savoy spent the first seven of those years coaching at St. Francis Xavier University before she came to Dal in 1977. Over the next 32 years, she led the Tigers to five Atlantic University Sport (AUS) playoff titles, 11 regular season titles and a silver medal in the 1980 CIS women’s championship. Within the AUS, her teams were often near unstoppable, with a consecutive 49-game winning streak between 1979-1982. The accolades and awards along the way were many, including five AUS Coach of the Year awards. As focused as Dr. Savoy was at getting the best out of her players on the court, she also set high standards for them in the classroom and the community. All of her players — literally 100 per cent — who spent three to five years with the Tigers graduated, with many becoming CIS Academic All-Canadians. When it came to giving back — to both academia and the community — Savoy led by example. She was a professor in Dal’s School of Health and Human Performance, the author of a book on team building for coaches and another on mental training for athletes, and an advocate for fellow colleagues as a university senator and president of the Dalhousie Faculty Association (DFA). She was also a tireless promoter of basketball and of women in sport beyond Dal, and brought her executive and coaching skills to the national and even international level. Although Dr. Savoy died of cancer in March 2015, her spirit still resonates — both through an award set up at Dal in her honour and in many other more intangible ways. “All the positive opportunities she helped create for women here at Dal and across the country live on as her legacy,” says Anna Stammberger, Dr. Savoy’s successor as coach of the women’s team. Indeed, while Dr. Savoy was known for being a tough and demanding coach, she was also deeply committed to building relationships with her players and was a mentor to many long after they’d left the Tigers. As she once said: “I'm not a maker of basketball players, but a maker of people."